Port Blair, Oct. 21: The Lt Governor, Lt Gen (Retd), A K Singh, today felicitated Reena Kumari, for winning the silver medal in the 19th Asian Junior Rowing Championship 2013, held at Samarkand, Uzbekistan from 13th to 16th October 2013. A cheque of Rs 3 lakh was presented to Ms Reena Kumari by the Lt Governor, as per laid down norms. The Indian Rowing team won 4 Silver Medals in all. Ms. Reena Kumari of A & N Islands, sitting as Main Stroke of the Coxless four, won one of the silver medals in 2000 mtrs event. 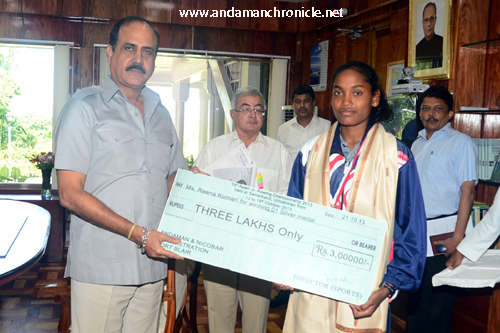 The Lt Governor congratulated her for winning the medal and bringing laurels to the Islands and the country as well. He also wished her good luck in her quest for medals in future. “I feel honoured and proud that my contribution in the field of sports has been recognized and none other than our own Lt Governor has felicitated me for the achievement”, said Reena Kumari to this Correspondent after the felicitation ceremony. She is currently a trainee of the Sports Authority of India, Special Area Games Centre, Port Blair. Meanwhile the PCC President Kuldeep Rai Sharma and all leaders of the Congress party have congratulated Miss Reena Kumari, daughter of Shri Sukra Kerketta, Worker of Rubber Project at Mildera, Katchal on her achievement.